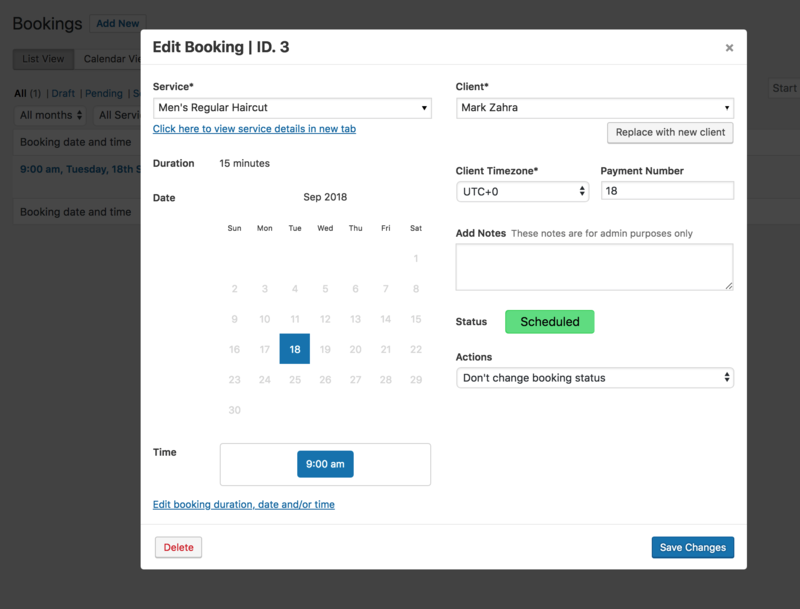 As the site administrator, you have the ability to manually create new bookings at any time. This is great if you need to also accept bookings in person, via email or on the phone. Go to Bookings > Bookings. Click on the Add New button on top of the page. 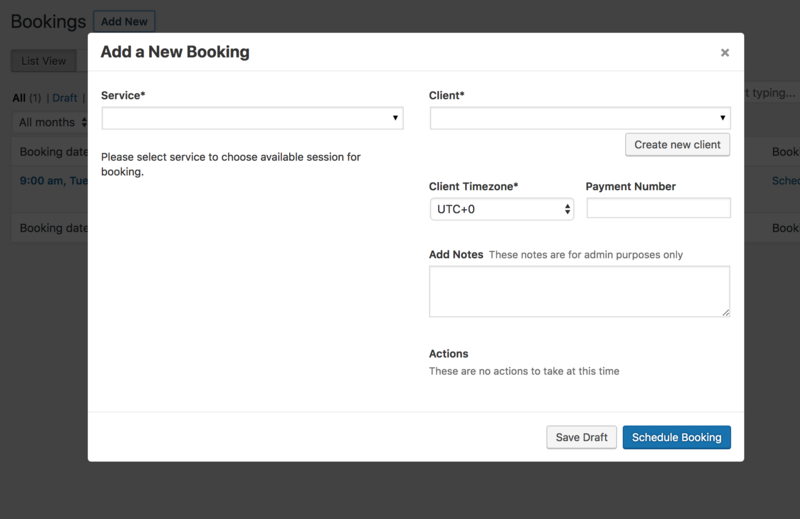 Once the Add new booking modal opens up, select the Service to be booked. Once a service is selected, if the service offers more than one possible session length (appointment duration), you will be asked to select a duration for this appointment. Once a duration is selected, a calendar (in month view) will appear with the available Days. Select one. Once the day is selected, the available Times for that day and that duration will be shown. Select one. Select an existing client from your database. You can do so by starting to type the client's name. The plugin will automatically start searching through your database and giving you a list of clients with that name. Select the correct one. Or you can create a new client on the fly. If this is a new client you may click on the Create new client button, enter their full name and email address, click the button to add the client, and voila. Your client is now in your database. If your client is in a different timezone to that of your business or your specific service, you may set a timezone specifically for this client and this booking. This will allow you to properly understand what day and time applies to you and your client. If there is an existing payment created within EDD that applies to this booking, you may record it in the next option. Save Draft - this will save the booking as a draft but not schedule it. This may be useful if your client is unsure of the date or time and wants to confirm later. Schedule Booking - this will officially schedule the booking and add it to your calendar as such.